Oct 24, 2011: NASA's MESSENGER spacecraft has discovered strange hollows on the surface of Mercury. Images taken from orbit reveal thousands of peculiar depressions at a variety of longitudes and latitudes, ranging in size from 60 feet to over a mile across and 60 to 120 feet deep. No one knows how they got there. "These hollows were a major surprise," says David Blewett, science team member from the Johns Hopkins University Applied Physics Laboratory. "We've been thinking of Mercury as a relic – a place that's really not changing much anymore, except by impact cratering. 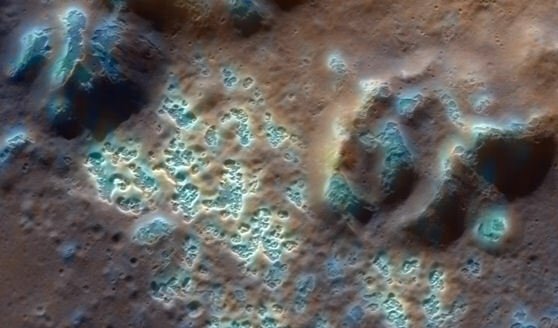 But the hollows appear to be younger than the craters in which they are found, and that means Mercury's surface is still evolving in a surprising way." Mars Reconnaissance Orbiter spotted similar depressions in the carbon dioxide ice at Mars' south pole, giving that surface a "swiss cheese" appearance. But on Mercury they're found in rock and often have bright interiors and halos. "We've never seen anything quite like this on a rocky surface." If you could stand in one of these "sleepy" hollows on Mercury's surface, you'd find yourself, like Ichabod Crane, in a quiet, still, haunting place, with a black sky above your head. "There's essentially no atmosphere on Mercury," explains Blewett. "And with no atmosphere, wind doesn't blow and rain doesn't fall. So the hollows weren't carved by wind or water. Other forces must be at work." As the planet closest to the Sun, Mercury is exposed to fierce heat and extreme space weather. Blewett believes these factors play a role. A key clue, he says, is that many of the hollows are associated with central mounds or mountains inside Mercury's impact craters. 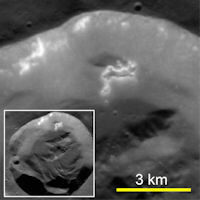 These so-called “peak rings” are thought to be made of material forced up from the depths by the impact that formed the crater. 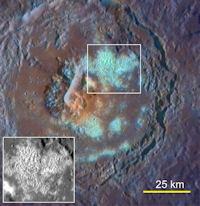 Excavated material could be unstable when it finds itself suddenly exposed at Mercury's surface. "Certain minerals, for example those that contain sulfur and other volatiles, would be easily vaporized by the onslaught of heat, solar wind, and micrometeoroids that Mercury experiences on a daily basis," he says. "Perhaps sulfur is vaporizing, leaving just the other minerals, and therefore weakening the rock and making it spongier. Then the rock would crumble and erode more readily, forming these depressions." MESSENGER has indeed proven Mercury unexpectedly rich in sulfur. That in itself is a surprise that's forcing scientists to rethink how Mercury was formed. The prevailing models suggest that either (1) very early in Solar System history, during the final sweep-up of the large planetesimals that formed the planets, a colossal impact tore off much of Mercury's rocky outer layering; or (2) a hot phase of the early Sun heated up the surface enough to scorch off the outer layers. In either case, the elements with a low boiling point – volatiles like sulfur and potassium – would have been driven off. "The old models just don't fit with the new data, so we'll have to look at other hypotheses." To figure out how the planets and Solar System came to be, scientists must understand Mercury. "It's the anchor at one end of the Solar System. Learning how Mercury formed will have major implications for the rest of the planets. And MESSENGER is showing that, up to now, we've been completely wrong about this little world in so many ways!" What other surprises does Mercury hold? The sleepy hollows of the innermost planet may be just the beginning. Credits: MESSENGER is the seventh mission in NASA’s Discovery Program of lower-cost, highly focused, planetary science investigations. Created in 1992, Discovery challenges teams of scientists and engineers to find innovative and imaginative ways to uncover the mysteries of the Solar System within limited, cost-capped budgets and schedules.The NASA Discovery Program is managed out of the Marshall Space Flight Center in Huntsville, Alabama. Sean C. Solomon of the Carnegie Institution of Washington (CIW) leads the MESSENGER mission as the Principal Investigator. The Johns Hopkins University Applied Physics Laboratory (APL), Laurel, Md., manages the MESSENGER mission for NASA’s Science Mission Directorate, Washington, D.C.